It happens in every kitchen—the spoons or forks disappear slowly, lost accidentally to the trash, or to the work or school lunch bag. If you’ve decided that new flatware is in order, there are options to fit any style and budget. We’ve got tips on what pieces you need, what to look for in stainless steel utensils, and how to properly care for them. The humble fork, spoon and knife have been around for centuries, and were some of the earliest human creations. Primitive utensils were carved from wood, bone, shell and other materials, but even those earliest iterations showcased personal taste, as they were often decorated with feathers, jewels and carved designs. In Europe during the Middle Ages, many meals were served on slices of stale bread known as trenchers, and only the wealthy used utensils, which was more for status than practicality. Knives and spoons were the most widely used, and before the fork came into use in Europe, two knives were used to eat—one to hold the food, and the other to cut. Only the wealthiest households provided utensils for guests; it was more common for travelers to carry their own cutlery, even when staying at an inn. The fork became widespread across Europe in the 18th century, eventually culminating in the knife, fork and spoon as a set. In today’s busy world, many families are lucky to sit down together for a meal—forget about fussy and formal place settings. But the most basic flatware configurations are four pieces, consisting of a knife, a dinner fork, a salad fork, and a dessert spoon/teaspoon. It’s hard to find a flatware set that doesn’t comprise at least these four staples. When setting the table, utensils are placed in the order of use, from the outside in. Forks to the left, and knives and spoons to the right (with a few exceptions that only come into play with very formal settings). In a basic setting, set the fork to the left of the plate, and the knife closest to the right of the plate, spoon next to the knife. A five piece flatware set is also common, and adds a larger soup spoon. The soup spoon fits in next to the teaspoon, on the far right. Etiquette says to leave anything off the table that won’t be used—no soup, no soup spoon! If you are pondering the purchase of new flatware, a five piece set provides the most versatility and should be more than sufficient for the modern host. While most modern flatware is dishwasher safe, you can extend the life of your utensils by heeding the advice of experts on how to properly wash and dry in your dishwasher. Don’t mix metals: Don’t cram in your flatware with other utensils and metals in the same load—it will scratch and wear the finish. Knives down, forks and spoons up: Point the knives down in the silverware basket to protect the cutting edge from wear and keep knives sharp. Forks and spoons should face up for best cleaning. 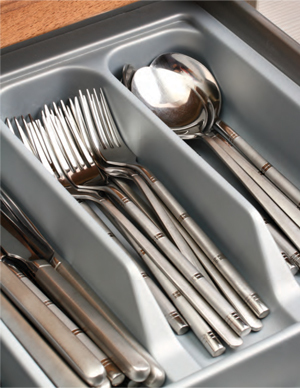 Skip the dry cycle: Remove flatware after the wash cycle and dry by hand, as hot air drying increases the chances of discoloration and corrosion. Say no to citrus: Cleaners containing lemon or orange additives can cause corrosion, so while a citrus scent is pleasant, it can be harmful to your flatware. Also avoid heavily chlorinated powders, liquids or gels—and never put them directly on flatware. Stainless steel is by far the most common material, and is loved for its durability. Dishwasher safe, it is a great option for daily use utensils, but its quality varies widely (as does price). Stainless steel flatware is commonly labeled as 18/0, 18/8, 18/10, or 13/0, referring to the percentages of chromium and nickel in the stainless steel alloy. The “18” or “13” refers to the chromium content, which gives flatware its rust-resistance properties, and the second number (the 0, 8 or 10), refers to the nickel content, which imparts the silver-like shine. These numbers have nothing to do with the weight or hand feel of a utensil. 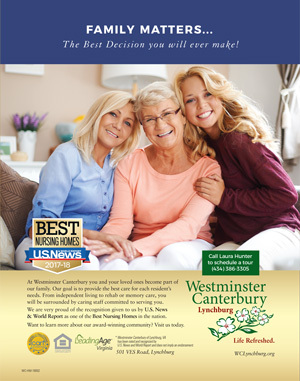 So, which one is better? It’s not a clear cut answer. 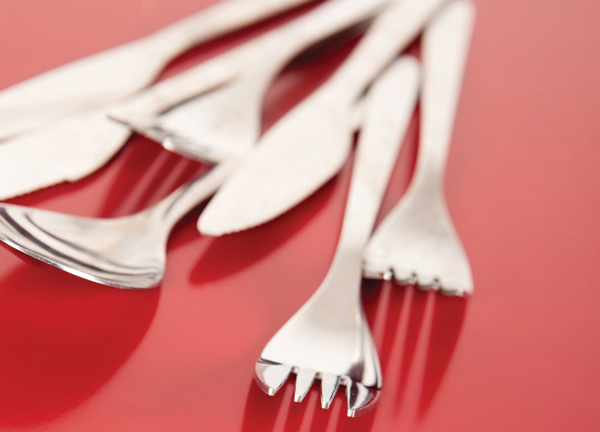 If you want flatware with high polish and good rust resistance, pick 18/8 or 18/10—experts say these are essentially the same, so don’t dismiss a pattern because it is 18/8 and not 18/10. If you want to keep costs down and aren’t concerned about polish, but want durability, chose 18/0 or 13/0. 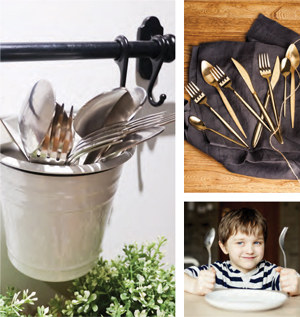 As gold and brass have come into vogue in home decor, flatware has followed suit. There are now gilded options for daily tableware—often a stainless base with a gold or brass colored coating. Be choosy, though; these options may be hand wash only, or the finish may have a limited warranty.